Hey. Thought I'd pop in since it's been a little while since you've heard from us. It's Melon here, but this is not another episode of Melon's Animal Adventures. I actually wanted to tell you about a little wee itty bitty problem we're having here in the Melon household. So here's the story. Cocoa used to, literally, turn tail and run at the mere sniff of a capsicum. That's not an exaggeration or figure of speech. Okay, so he doesn't have a tail. But run he certainly did. But guess what? After a surgery a few years ago, a vet once told us to give Cocoa a cherry tomato a day, for vitamin C. We obediently bought a box of cherry tomatoes and placed one in the cage for Cocoa. He never acknowledged it. It was like it didn't exist, or at least it certainly wasn't something edible. Every day since he's eaten both happily. ... Do you think we have the wrong guinea pig? At the vet's last month we dropped him off and they tried to return a bunny named Chocco to us in the waiting room. They were quite embarrassed and went back for Cocoa… or what we thought was Cocoa. What if it was just a diversion, to distract us from the fact that they actually swapped our pig for another one? 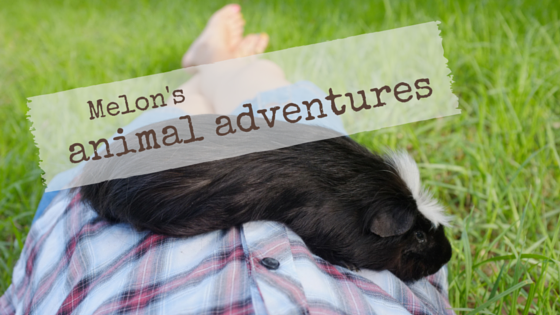 There are a lot of longish haired, black guinea pigs with a dramatically white crest… right? Right? Please let me know if you have any tips on how to swap this imposter back for the real Cocoa. LOL an imposter. Cocoa are you playing tricks on everybody? Have a serene Sunday. Yes, I have learnt that re-offering the food a couple of times can get results. Funny how they know automatically some things are food and then others seem to be more of an acquired taste. BOL - you are joking, right? Phantom is like that, one day he turns his nose up to something and a month later he wants it. Could he be an impostor too? Cocoa here. Just found this post - she BETTER be joking! I'm sure one could identify our own sweet Phantom at once... although I'm guessing he could surprise us with mischief once in a while too! Cocoa an impostor... never! And we have never seen another black piggy with this unique hair do, so no swap either. Something must be wrong with the veggies. Maybe the tomatos are not bio quality? It is true, we decided that if the vets needed another pig who looked like Cocoa they would have to get a another pig and dye its hair, haha! What does bio quality mean? I realise now that sometimes you just need to introduce pigs a few times to the same food before they will eat it. I have wondered about how good pigs are at telling the quality of food though - I bet they have instincts we humans no longer have! ´hi! If you want we can send you a card! We have guinea pigs too, they get carrot or other things to get vitamin c every day. We're saying it is an after effect of the anesthetic! Did you cut the cherry tomatoes the first time too? If not, maybe that made a difference? Whatever it is, we are sure there is only one Cocoa! An original!! Haha, maybe it is! I think we did cut the cherry tomatoes in the end, to try and entice him to eat them... no luck. Until now, apparently, several years later! Hehe, we just google imaged 'black american crested guinea pig' to take a look... it is a surprise to see a few guineas with similar markings (nice, demure little white crests) but certainly with nothing as punk as Cocoa's! Haha! Q: Why is Cocoa a lone pig?